Hello! I’m Allie McCormack, the Rare Books Catalog Librarian for the Baylor Libraries. Though you may not be familiar with my title, I think I have one of the best jobs on campus. I create bibliographic records for the rare, historical, or otherwise “special” books at Baylor—meaning that I get a sneak peek of everything before it’s put on the shelf. 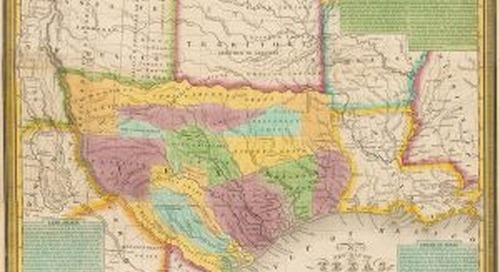 The Texas Collection invited me to write about some of my favorite items from their collection, so I’ll be posting a series of guest entries about some of the oldest, rarest, and most interesting things I’ve cataloged for them. The first book I want to share with you is a copy of the first Bible printed the American colonies in a European language: a 1743 Bible designed by the famed Pennsylvania printer Christoph Sauer. 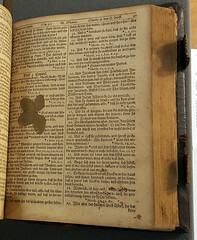 The first Bible printed in the colonies, the so-called “Eliot Indian Bible,” dates to 1663 and was in a dialect of Algonquian, a language spoken by Native Americans in Massachusetts. Sauer was born in Germany and immigrated to Pennsylvania in 1724, settling in the aptly-named Germantown among other families from his homeland. At first, Sauer imported Bibles and other religious books directly from Germany, but he started his own printing and publishing business in 1735. 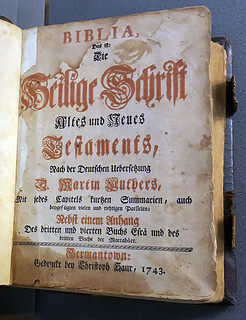 Only 1,200 copies of this Bible, based on Martin Luther’s translation, were printed. It would be another 40 years before an English-language Bible was printed in North America. 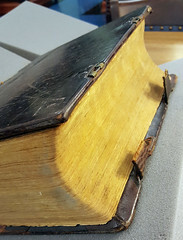 Remarkably, The Texas Collection’s copy appears to be in its original leather binding. You can see here the remnants of the original brass clasps. The thin leather strips they were attached to break very easily. 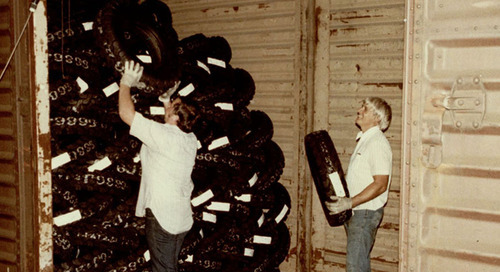 It’s not obvious in this photo, but a later owner tried to reattach them with staples! This next image shows the impressive title page. The typeface used is called Fraktur. We may find it hard to read, but it was the preferred font for German printers through the end of World War II. Jack-of-all-trades Benjamin Franklin was the main supplier of printed texts to Pennsylvania German communities before Sauer, but he only used Roman typefaces (think Times New Roman). Sauer imported type from Frankfurt for his business, and German readers responded enthusiastically to the familiar style. Here are the first pages of the Bible: the index and the “First Book of Moses.” Note that it’s not called Genesis in this Bible. Similarly, Exodus is referred to as the “Second Book of Moses” and so on. If you look closely, you’ll see that not all of the text is in Fraktur. Sauer used Roman type to show cross-references and allusions in Scripture. Using two different typefaces like this isn’t uncommon in German printing, though Fraktur is almost always used for the main body of text. I’ll leave you with an unexpected surprise I found in this book—pressed flowers! It’s not unusual for me to find plants, newspaper clippings, receipts, and other ephemera in the books I catalog, but I rarely see more than one per volume. This Bible had three flowers that I noticed, and there are likely more hidden between the pages. The curators and I chose to leave them in to document how owners throughout the years used the book. If you come across something like this as you explore special collections materials, please be sure to ask a librarian before removing it! 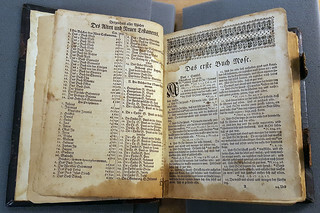 If you’d like to look at another book printed by Christoph Sauer, make an appointment to see this Psalm- and hymn-book from 1753 held by Crouch Fine Arts Library. To find early Bibles and Biblical commentaries held by the Baylor special collections libraries, follow this link. If you’d like to look at other rare German books, these are available at the Texas Collection, while there are many more across campus.